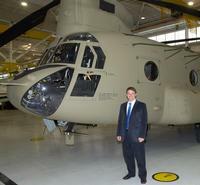 Chinook program leaders also understood the Army-Industry team building their new aircraft. Mr. Langhout recalls, “The many suppliers that supported Boeing were brought into the inner circle of the family we called Team Chinook. I was lucky enough to be a part of that incredibly positive and focused environment. Our soldiers needed the Chinook in Afghanistan, and there was no way we were going to fail our soldiers. The Aviation Engineering Directorate is already considering the challenges of Future Vertical Lift. “AED recently completed a program commissioned by the Aviation Development Directorate to begin the process to understand the affordability and technical challenges of these incredibly complex aircraft of the future. Over a period of nine months, AED along with industry, academia, and other government organizations worked together to understand the knowns and unknowns of advanced materials and processes -- auto code, additive manufacturing, model-based design, etc. -- as they relate to qualification. What we have learned is that we have a very long way to go and we must continue to learn from the commercial sector on how they are qualifying highly advanced aircraft for the FAA. Specs and Standards are having to be updated, and AED is in the middle of it all.